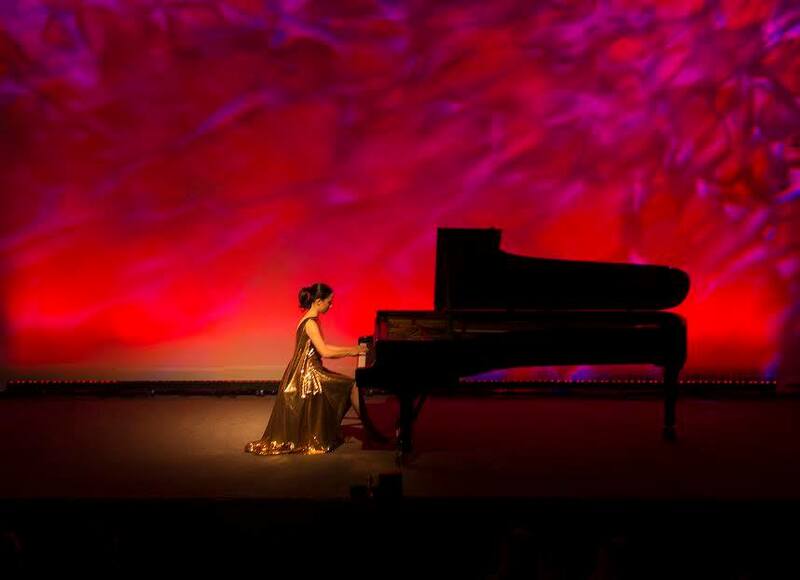 “ABU DHABI – A stunning piano recital from French prodigy Lydie Solomon opened the revitalised Abu Dhabi Classics 2014/2015 concert season last night, with the soloist receiving a standing ovation after her debut appearance in Arabia. Playing to a full house at the Manarat Al Saadiyat arts and culture centre on Saadiyat Island, the 32-year-old soloist led the audience through her concert dedicated to the travels of Polish composer Frédéric Chopin. The performance was part of this season's Classics theme ‘The Traveller' – highlighting some of the best classical music from East and West. Following a three-year break, Abu Dhabi Classics has been reintroduced by Abu Dhabi Tourism & Culture Authority (TCA Abu Dhabi) and runs from October until May. Leading international musicians and orchestras will perform at numerous venues across Abu Dhabi city, Saadiyat Island and the emirate's heritage heartland, the UNESCO World Heritage site of Al Ain. Solomon, whose father is French and mother is South Korean, started playing the piano at the age of two by playing Beethoven's Ode to Joy by ear. At 10 years old, she gave her first recital at Belgium's ‘Printemps Musical de Silly' and at 13 her first broadcast concert with the ‘Orchestre de la Garde Républicaine' for Radio France. Speaking after last night's sold out concert she said: “This was very emotional for me. The audience was part of the story and we were all on a journey together. It was a great pleasure for me to perform here in Abu Dhabi as I am always moved to discover new cultures, languages and people. This is my first time in an Arabic country and I have been very impressed and am already looking forward to returning. Dr Ronald Perlwitz, Head of Music Programming, Culture Sector, TCA Abu Dhabi, said the evening was an outstanding success and showed the level of talent that has been attracted to perform in the emirate during the Classics season.